We hope you enjoy the collection of Rotorua Marathon thoughts from the day that have been contributed from some of our members completing the marathon. As spectators on the day we were proud to be part of the Hawks running club and watch many of our members tough it out on the course. See over 150 photos by clicking on one of the photos below and the Hawks results are at the bottom of this post. The Marathon is unlike any other event. You can sometimes bluff your way through a half marathon but the marathon will find any little chink in the armour . It can be anything from not enough training – Nutrition mistakes , hydration, over estimating pace , effects of a virus and bang! You are confronted with the dreaded wall – normally around the 30- 35 K – A lot of marathoners would have experienced it – some never have. Your legs start to cramp and refuse to function normally – each step is a major effort. You run on memory and you just want to walk. Basically what has happened is that you have run out of fuel. Your muscles have used up all the stored fuel and have switched to standby mode and are now using slow burning fats to keep going. Your training has prepared your body to run efficiently and has improved the cardio vascular system but just like a car uses more fuel when going fast – if your pace is a little faster than what you are capable of you burn up all your stores before the finish. 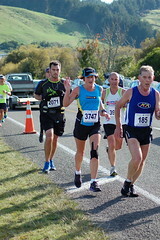 The Rotorua Marathon is with its hills , is even more testing on runners. Running up the hills can use up your fuel reserves faster, and because they come earlier in the race when you are normally feeling good, you don’t know you are doing it. On the other hand – get it just right and you almost float to the finish line – Trish Stockman and Ryan Stacey probably experienced this – Saturdays marathon had a great turnout of Hawks runners and it was good to see the huge crowds and the excitement at the start. Unfortunately the results don’t mention the club so looking for Hawks runners amongst the 4000 odd runners is a mission. Well done to all the Hawks Marathoners – Those that experienced the ecstasy – those that experienced the agony – and all the others in between. 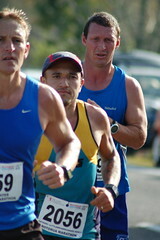 Rotorua was the place to be last Saturday with the running of the 50th marathon and associated events. Hawks had a great participation rate and checking through the results these efforts caught my eye. Apologies for those missed but some 8000 names had to be checked. In 31st and fastest Hawk? was Anthony Hancy 2.56.28. He was just two seconds ahead of Marion Millward who won the W55 title with her 3.08.49. A brilliant effort. She was tracked most of the way by former Hawk and Olympic walker Craig Barrett who was given the same time.Trish Stockman 3.23.49 made up the third member of the Hawks women’s team that placed a creditable third in the teams race. As Marion said after 15 years running Rotorua she was chuffed the club had a team. Trish was 3rd in the W50 grade which was a mighty effort. Maureen Leonard 3.43.13 completed her first marathon. Brian Smith 6.24.39 – 3rd in the M80 grade.MIkayla Nielsen won the Womens half marathon with 1.26.11 and it was good to see former W16 road champ Rachel Smith back running with 4th in 1.28.23. Sign her up quick as she could be a strong contender for the National Road relay team.Jenni Hoogeveen with 44.53 was third woman in the quarter marathon. Tis was the morning of the big one, not a creature was stirring not even my brats….ok so that was a lie they where up before the sun…. we scurried to get ready, in the car we all popped , the ducklings the wife and the LittleBrownrunner. Adrenalin was pumping as I met with my coach Mr Hadley himself.. With his inspirational talk , to kick my 3hr time to the curve, i was ready and craving this run for my PB time…….Keeping to my splits I was feeling like a sprit-lie wee thing then at 20k a quick wave to the Fam as I pumped up the speed…. through the clearing of runners, is that the finish line i see….common legs this is what we have been working for…. Stepping it up a gear i brought us home the LittlebrownRunner and his legs in tow…2.56 PB YES i did it all the hard work defiantly showed….So a big thank you to the coach with the most Hadley you are the bomb …. Another beautiful, sunny yet freezing day in Rotorua at the start of the marathon. My body has weather confusion. It is not sure if I should be sweating or shivering. But, you are not here for a meteorological report. You are here for a race report. I set off up the front due to Coach Dudfield telling me to “move on up” (with a shake of his arm) in front of the 3 hour pacer – with the elites! Ekkkk. But the start line is like artery to the heart – they are never big enough for the job that has to be done, so it was shoulder to shoulder, but the best place to start (I figure only now). I set off with an end time in mind and a pace that I was going to stick to. It was only four 10km time trials with a cool down, right? I got to half way: spot on, the next 7km was feeling good, great time, caught up with Hadley and got some wise words (and loads of them). At the 30km mark the headwind kicked in, (very minute but still a good reason to slow down?) my legs just didn’t want to move. At the 40km mark, I gave myself a stern warning to stop mucking around and picked up the pace, finishing strong BUT I had forgotten about my game face! The photos are terrible, but I didn’t feel any better than the photos look. I had achieved a PB marathon time. It wouldn’t have been possible without the support from all hawks members on and off the field. So thank you all! 3.08.40 marathon pb after a very tough day at the office facing the dark side of marathon running from 12 km to go. I am at the start because it is on my bucket list, Rotorua 50th anniversary Marathon for my 50th if I am going to do a marathon this is the one. After 7 weeks training and 1x 30km run I’m off, ok run easy, pace yourself I hear Graham saying, I started nice and easy, Marion catches up to me at 800m we have a quick hug and a good luck and off she goes. I am on my own but chat to whoever would listen around me, in the distance I see Oscar and by 4km I have caught up I run with him and some others chatting away, Oscar is really worried that I am going too fast and I will suffer at 30km. I feel great so on I trundle. Hmmm toilets and a familiar face with Dion running back into the pack from his little rest stop.Dion another 1st time marathoner with a lot more training under his belt, decides to run with me, we run, chat and check each KM with our watches, some seem long, some short and some super fast. It is fun and we were running well. Just before half way Dion decides to run on ahead. I run with my new friends, one guy says gee you are popular Trish, its because I have fantastic encouragement from all the Hawks supporters along the way. At ½ way the clock said 1:44.30 if I kept going I could make 3:30 (my goal was between 3:30 and 3:45). I feel great still, but have those last few killer hills to contend with and have heard they take it all out of you.I run the hills easily and pass people still feeling fantastic but thinking I must be slowing down. Dot and Chris are there on their bikes encouraging me, downhill, then the Airport gradient hill. I had my last gel stop Helen, Mike, Wendy and Colin are there saying what are you stopping for keep going, (it was part of the advice I was given, as a rookie if you have a gel, stop and have a good cup or more of water. (I stopped 3 times)). Off I go again the final few KM’s then the finish, when is the pain going to start? 4kms to go Chris gives me a drink of her magic water, at that point I think if I go faster I’ll get to the finish quicker (Smart advice Trish). My last few KMs are my fastest. I finish feeling great but overwhelmed. 3:23:40 3rd in my age and 2nd in the NZ champs. Icing on the cake 3rd in the teams with Marion and Kovo.Saturday 3rd May has been the highlight of my running, it was just my day. Thank you so much Graham and those who helped me on the training journey, and thank you to the amazing Hawks for the advice and encouragement throughout the day. We are a great bunch of runners.